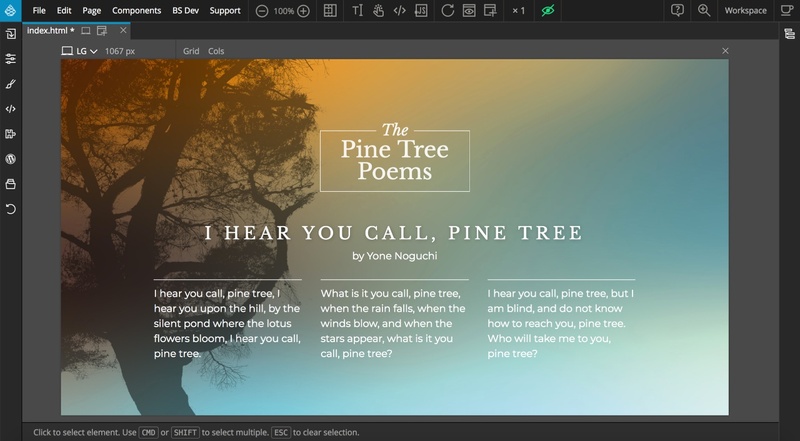 Pinegrow comes with a powerful and flexible user interface that gets out of your way when you don’t need it. Let’s get familiar with the user interface. Double click on any tab to collapse its panel. This is useful for putting away the panels that you don’t need for the task at hand. 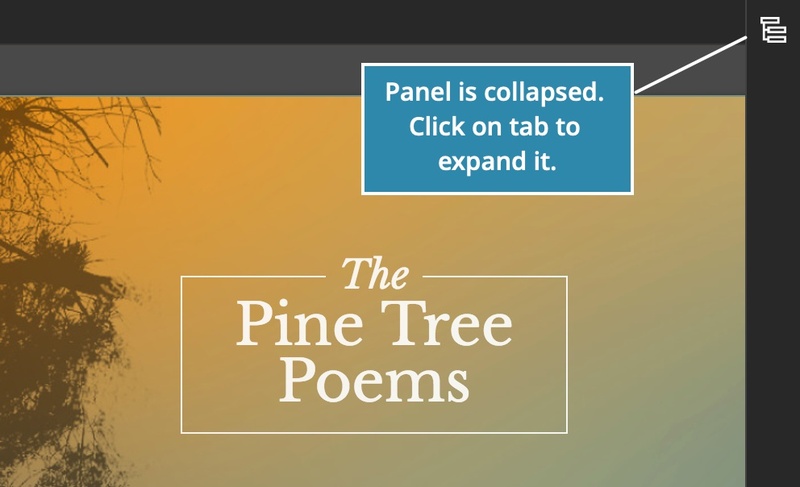 Click on any tab in the collapse panel to expand it back to its original size. Drag tabs from panel to panel, or drag them to a border between the existing panels to open them as separate panels. 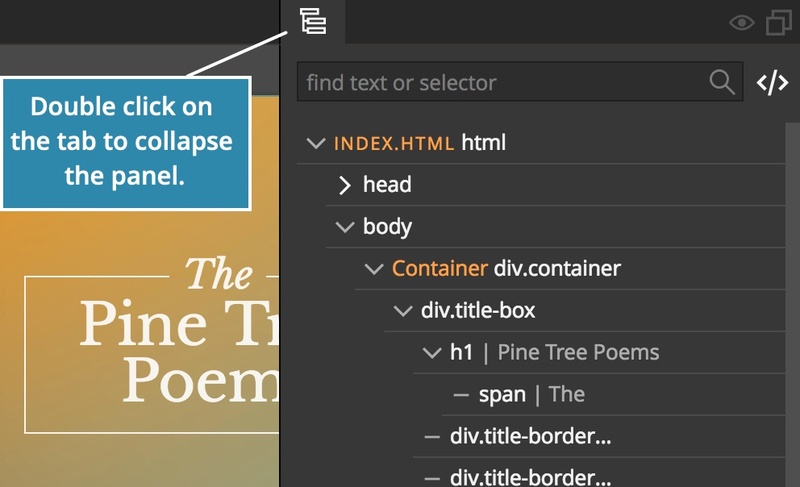 Drag the empty area of the panel header (on the right side of its tabs) to drag the whole panel to the new position. The page area with page views is not draggable. But its tabs can be rearanged and dragged to the side in order to split the page area. Click on in the panel header to open the panel group in a floating window. 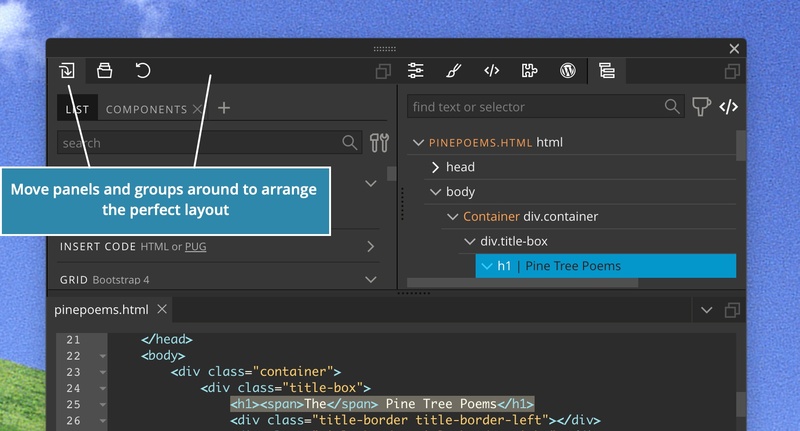 Floating panels can be freely moved around the screen(s) and resized like normal windows. Move panels and panel groups between windows. 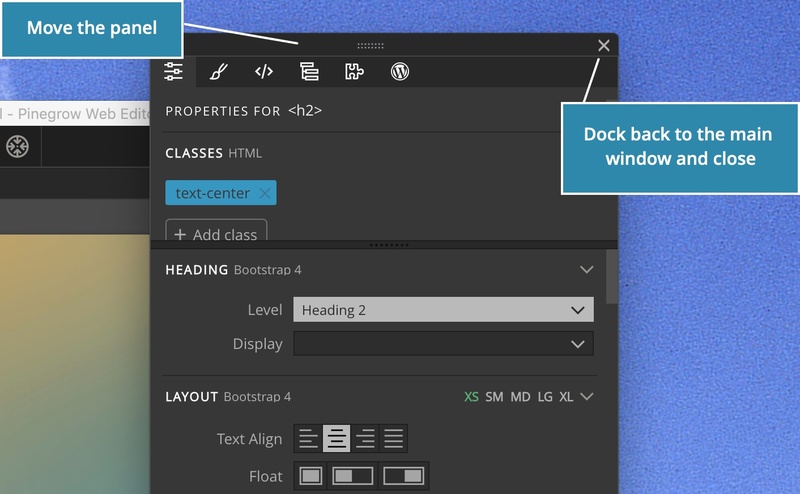 Close the window to dock its panels back to the main window. Moving and closing the window. An layout example for two screens. Keep everything organized in one window. Float panels in separate windows to have more flexibility with arranging them. 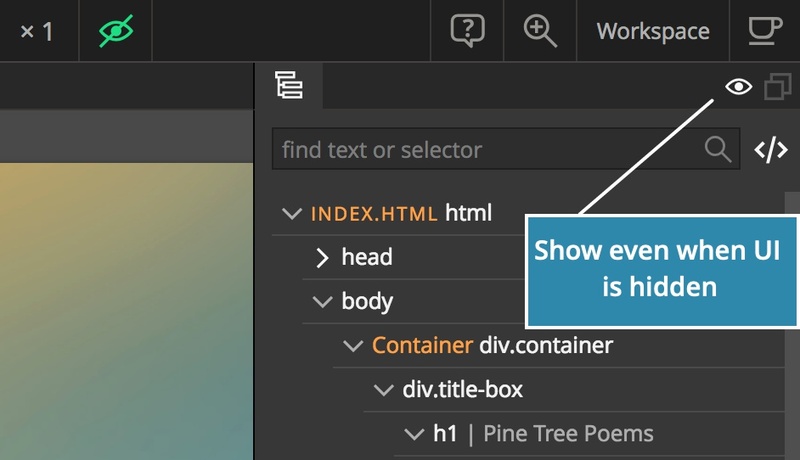 Use icon in the top toolbar or press TAB (when not in code editor or in field input) to hide the UI. All panels will be collapsed. Nothing to distract from your page. Repeat the operation to show the panels again. Toggle icon in panel headers to make that panel always visible, even when the UI is hidden. Make panels immune to hiding. Some tools open in quick windows. Quick windows are meant to be open for a short time, just for a specific task. You can move them around, resize them and double click the header to reposition them on screen. + opens the quick insert Library window. P opens quick Element properties. 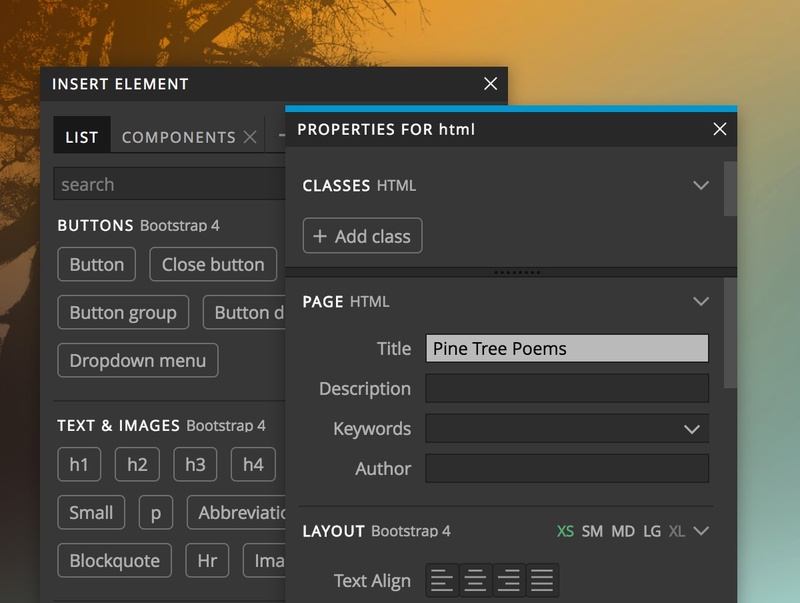 C brings up the quick Element code editor. L opens the Assign classes quick window. Quick windows are handy for getting access to important features while the relevant panels are collapsed or if the whole UI is hidden. A workspace is a certain arrangement of panels in the UI. 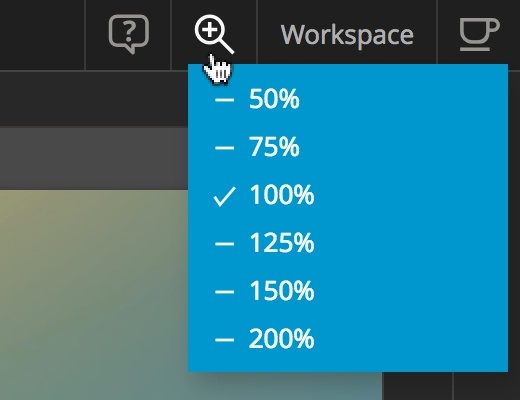 Use Workspace menu on the top right side to switch between the predefined layouts and your own saved workspace layouts. 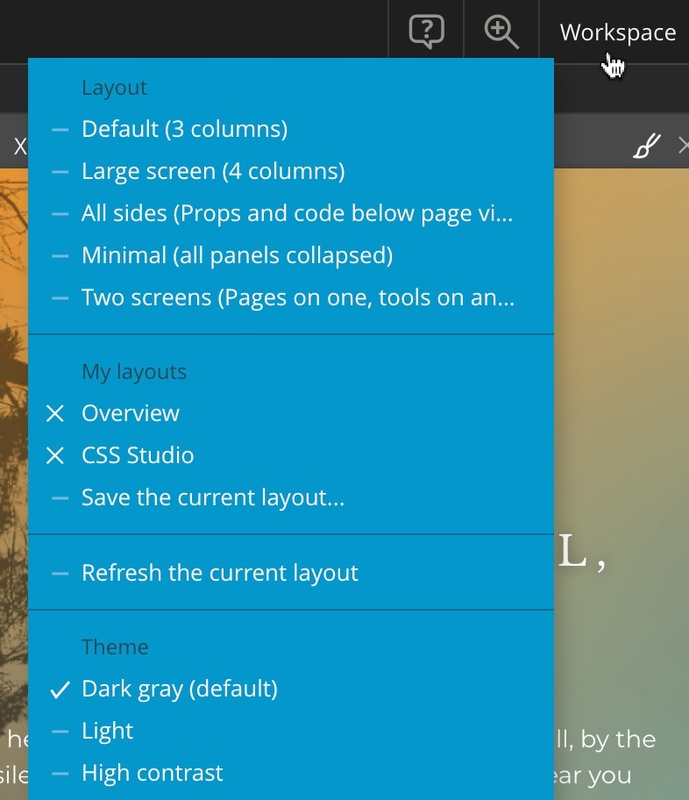 Restore a saved or predefined layout using the Workspace menu, if everything else fails.